Eduardo Souto de Moura nabs architecture’s top honor. The winner of this year’s $100,000 Pritzker Prize, architecture’s very own Nobel, is 58-year-old Eduardo Souto de Moura. Wait… Who?!? 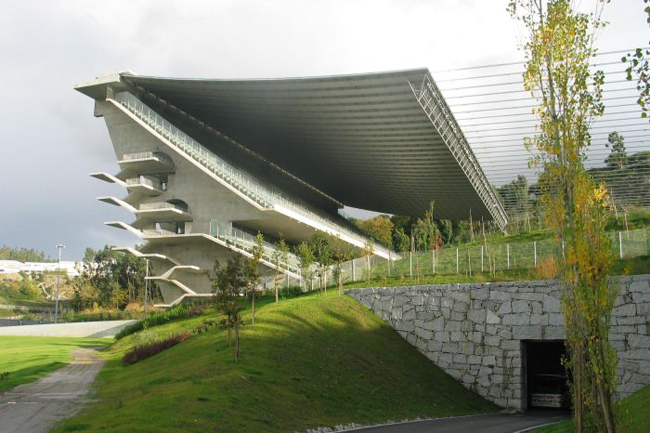 Souto de Moura is a Portugeuse architect, who has worked primarily in his native country, most notably designing a cone-shaped museum made out of bright red concrete in Cascais and a football stadium carved into a quarry in Braga. Never heard of either building? Surely, you’re not alone. Unlike most of his Pritzker predecessors, Souto de Moura is a virtual nobody outside the rarefied world of haute architecture. We shouldn’t be terribly surprised; this is just how the Pritzker committee rolls. They’ll spend several years saluting the most famous (and obvious) characters in architecture (Renzo Piano, 1998; Norman Foster, 1999; Rem Koolhaas, 2000), then they’ll go and hand the Pritzker over to someone “avant-garde” (Paulo Mendes da Rocha, 2006). Not that we’re calling Souto de Moura avant-garde — his style has more of a homegrown, regional flavor — it’s just that he’s a curious choice given the megawatt names that haven’t won architecture’s top honor, like Steven Holl, Toyo Ito, and Shigeru Ban (and don’t even mention how Denise Scott Brown was slighted). Judge for yourself at ArchDaily, which has a couple more examples of Souto de Moura’s work.